Buy Zie Darling a Coffee. ko-fi.com/ziedarling - Ko-fi ❤️ Where creators get paid by fans, with a 'Buy Me a Coffee' button. 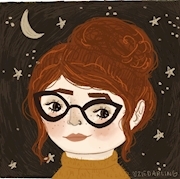 Illustrator and storyteller living in Nashville, eating a lot of sushi and cheese fries. HI! Thank you so much for buying me a decaf coffee or herbal tea! It really keeps me going as an illustrator, storyteller and decaf-aficionado. You're the bestest ever. Secured Payments. Support goes to Zie Darling's account. Upgrade Zie Darling to a yearly Gold Membership with a one-time payment.